If Wade Phillips is being honest, he was concerned about what he’d get from Von Miller this season. He knew the potential for growth and greatness was there. He knew a third straight Pro Bowl should be more probable than possible. He knew his defense needed its most lethal weapon to continue being lethal if the Broncos had any hope of defending their Super Bowl title. But the defensive coordinator had also seen a few backslides during his 38 seasons in the NFL. Guys have a big year, sign a huge contract, and then succumb to the pressure and new expectations that come with the money. The recipe was ripe for Miller to falter. The 27-year-old turned in one of the greatest defensive playoff performances in history and won the Super Bowl 50 MVP, but then jetsetted across the country for much of the next six months. Dancing With the Stars. The Ellen DeGeneres Show. The Today Show. The Late Late Show. Celebrity Family Feud. Saturday Night Live. The ESPYS. The Grammys. The Country Music Awards. The Kids’ Choice Awards. Parties. Commercials. Sponsor appearances. All the while, the star linebacker’s contract negotiations seemingly spiraled out of control. Miller anticipated they’d be peaceful, but then felt the Broncos low-balled him. The sides stopped speaking. Trade rumors surfaced. He skipped OTAs. Holdout reports swirled. Broncos GM John Elway may or may not have been purposely cropped out of an Instagram photo. Finally, he inked a contract just before the July 15 deadline: Six years, $114.5 million, $70 million guaranteed, the highest-paid non-quarterback in NFL history. 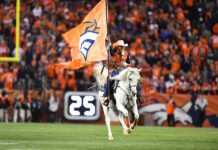 Yet, that megadeal assuaged no fears in Broncos Country. Not only had the team just tied a hefty chunk of its salary cap to one player, said player had just missed every offseason workout and was spotted more on TV than in the gym. Many feared he’d enter training camp out of shape, bloated with money, and no longer possessing the drive to perform at a level that earns landmark contracts. “You always worry about that,” Phillips confessed. “People, because they give you a whole lot of money, they expect you to be superhuman. And if you don’t live up to expectations, well then…” Phillips doesn’t say it, but doesn’t have to: The weight can squash a career. “So it was pressure on him, but that hasn’t slowed him down,” Phillips says. Miller proved his fitness was fine during the preseason. He opened the regular season with a crucial fourth-quarter sack of Cam Newton. He dropped Andrew Luck on three occasions in Week 2. He recorded at least half a sack in each of the first six games and led the NFL with 13.5 sacks through Week 14. That has him at the center of the Defensive Player of the Year discussion. That guy was an easy choice for Mile High Sports 2016 Sportsperson of the Year. The last time Miller posted an All-Pro season, he followed with the worst year of his career. His 18.5 sacks in 2012 ranked third in the NFL and resulted in his first selection to the AP All-Pro first team, as well as a second trip to the Pro Bowl. Then he was suspended for the first six games of 2013 for violating the league’s drug policy. After nine games played and only five sacks, Miller tore his ACL and missed the rest of the season, including Super Bowl XLVIII. His family – mother, Gloria; father, Von Sr.; and younger brother, Vins – moved into his Denver home to get him back on track. Miller earned All-Pro and Pro Bowl nods again after the 2015 season, announcements that actually came prior to his spectacular postseason. Miller’s sack total reached only 11, the lowest mark of his career aside from that dismal 2013. But the honors were validated when he picked off Tom Brady and sacked him 2.5 times in the AFC Championship Game and in the Super Bowl brought down Newton 2.5 times and forced two fumbles. Those two games added millions to Miller’s megadeal. While he gallivanted over the summer, Miller vowed to not let up. He aimed to be the same guy during the 2016 season as he was during the early 2016 playoff run. In fact, he made designs to be better. Over the next 15 minutes, as he stabs at a late lunch of meatballs and steamed vegetables in the team cafeteria, Miller utters some form of “I’m just trying to be the best Von Miller I can possibly be” a handful more times. That’s his motivation. It’s not the money. It’s not the awards. It’s not anything other than wanting to be great. 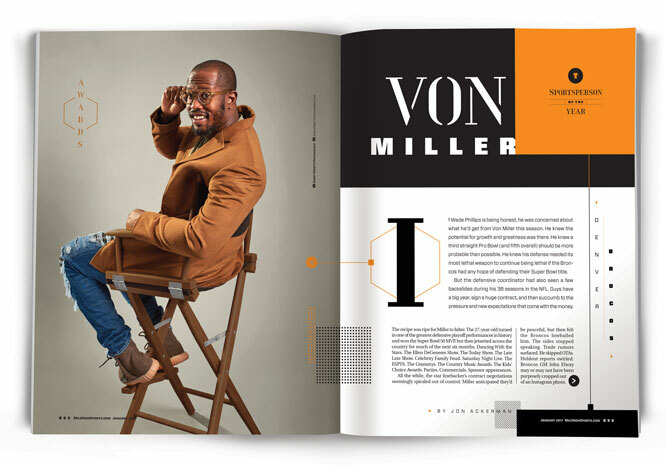 “I want to be the best possible Von that I can possibly be, while I have the moment, while I have the opportunity, while I’m still young, while I’m still athletic. I’m right in the middle of my career; I just want to take full advantage. So I was going to want to do that whether there was money involved or not. “Now, money? The contract is always great. Of course, it’s life-changing. But when I came into the league, I was the No. 2 pick, so it wasn’t like it was my first go-around with stardom or the financial side of it. It’s bigger than that to me. It’s about legacy. 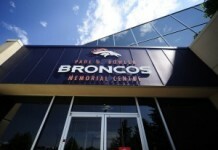 It’s about putting a career together that’s similar to John [Elway]’s career, or Peyton Manning’s career. Those are the type of guys I aspire to be – in my own type of way, though. Money wasn’t a big deal in their careers, and it’s not in mine either,” he says. The cash can’t be ignored, though. Only Luck has ever received more guaranteed money ($87 million). It’s natural for the staggering numbers to burden a man, but Miller insists he doesn’t feel it. Instead, he seeks the approval of his peers. He wants to be liked. He doesn’t want to let people down. It started with his father. Von Jr. yearned to play peewee football, but Von Sr. didn’t think his fifth-grader was ready. So little Von convinced his mom, who agreed to keep his participation a secret. At the time, he was a “skinny little nerd with the Rec Specs strapped over his helmet,” Von wrote in a Players’ Tribune article. Before long, Von proved not only that could he play, but that he could take the abuse from peers who ridiculed his appearance. His squad never lost en route to the championship game, at which point he had to tell his dad. Von Sr. admitted his son actually was ready. Then, his boy’s squad took the title. Von Jr. loved the camaraderie and soon discovered he was quite good at the competition. He gained confidence. He told his closest buddies he was going be a top-five NFL pick. At Texas A&M, his drive for greatness once got the best of him. Prior to his sophomore season he set a goal for 15 sacks on the year – and ended it with three. The next year, with no such goal, he tallied 17 sacks to lead the NCAA. He’s refused to aspire for a number since. But he doesn’t refuse to help his teammates. At A&M he’d repeatedly race past the offensive tackles in practice and afterward give them tips on how to stop him. When it came time for the Aggies’ pro day, Miller was advised not to run. But he did so anyway, knowing his participation would attract more scouts, thus giving less-heralded teammates a greater chance to impress. Six years in, Miller has done enough to force speculation on where he might rank at the end of his career. Here are some comparisons: Through 85 career regular season games, Miller racked up 73.5 sacks (.864 per game); he’s tallied 6.5 more in seven playoff games (.928). The NFL’s all-time sack leader, Bruce Smith, recorded 200 in 279 regular season contests (.719) and 14.5 in 20 postseason appearances (.725). History’s second-best sackmaster, Reggie White, posted 198 sacks in 232 regular season games (.853) and 12 more in 19 playoff games (.631). Against Kansas City during Week 12 this season, the first of Miller’s three sacks pushed him past 70 for his career. It took him 83 games, exactly as long as Smith. Only Derrick Thomas (82 games), J.J. Watt (75), and White (57) reached the mark quicker. So, Miller finds himself in stellar company. But much more work lies ahead if he’s to keep pace. It can be argued that Miller isn’t even the best defender from his 2011 draft. Taken at No. 11 that year was Watt to the Texans. All he’s done is accept the NFL Defensive Player of the Year award three of the past four seasons. Frankly, it’s an honor Miller must earn at least once to be considered among the all-time greats. Randy Gradishar is the lone Bronco to receive the accolade (1978). White (’87 and ’98) and Smith (’90 and ’96) each collected the honor twice. The only other player to win three DPOYs was Lawrence Taylor (’81, ’82 and ’86). That Miller is in the conversation with these legends is a feat, considering he’s never led the league in sacks nor been the Player of the Year. But he does boast one accolade over all the aforementioned greats: Super Bowl MVP. No season has been better than the present for Miller. Watt has been on IR since Week 3, but even if he had been playing all year, Miller might still have outpaced him. Through Week 14 had he been held without a sack in only three games. Not only was he the NFL’s sack leader, he was the pressure leader, too. Per Pro Football Focus, Miller’s 72 total pressures (14 sacks, 8 hits and 50 hurries) were tied for tops. Should Miller be the 2016 Defensive Player of the Year? “Obviously he should be,” Phillips says without hesitation. The coach points to the Jacksonville game as a prime example. He’d never seen someone double-teamed as much as Miller was. Still, Miller forced a turnover in the third quarter by driving the left tackle into quarterback Blake Bortles, hitting him as he threw. The ball fluttered behind the intended receiver and Bradley Roby hauled it in for a 51-yard pick-six. In the fourth, Miller bull-rushed the right tackle into Bortles, causing the quarterback to fumble. Ray recovered to seal the victory. “Von’s unique in his own way. Reggie was a special guy because of his power and his size; he could move so well for his size. And then Bruce Smith had great quickness. Von’s got a lot of power for his size, but he’s more like Bruce in that he’s got great speed and great lateral movement and acceleration, [which] a lot of guys don’t have,” Phillips says. Brady likens Miller to Taylor – high praise from arguably the greatest quarterback ever, mentioning arguably the greatest defender ever. Miller used to liken himself to Thomas, whom he studied before entering the NFL and later copied in jersey number (58). But as a native Texan, Miller also looked up to Ware, who suited up as a Cowboy for nine years before moving to Denver. Ware recognizes his influence on his protégé and uses it to fuel him. He reminds Miller that he once logged 20 sacks in a season and led the league, feats Miller has yet to accomplish. Or Ware will vocally agree with the talking heads who say Miller plays like AFC West pass-rushing foes Khalil Mack or Justin Houston. “That gets him fired up,” Ware says. Ware thinks he’s getting under Miller’s skin, but Miller won’t admit to it. He does allow, though, that he listens to Ware. The approach is working. 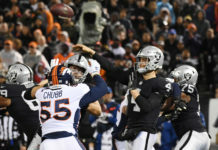 After turning in last year’s best postseason, and the best Super Bowl performance, and signing the best contract ever for a defender, Miller enjoyed his best year as a pro and certainly the best year for a Colorado sportsperson. What’s even better? He still may not yet be the best Von Miller he can possibly be.